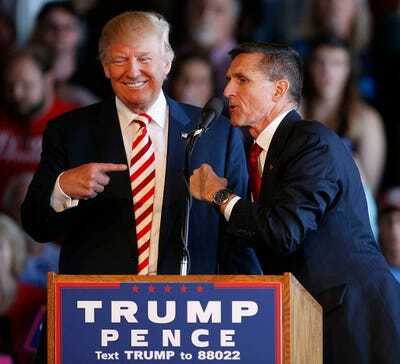 President Donald Trump’s legal team is reportedly planning to characterise former national security adviser Michael Flynn as a liar if he accuses Trump of wrongdoing to federal prosecutors. Any attacks on Flynn would mark a departure from Trump’s consistent praise of the retired general. And it would raise questions about when and why he lost faith in Flynn. President Donald Trump’s lawyers are reportedly preparing to cast former national security Michael Flynn as a liar if Flynn accuses Trump of any wrongdoing as part of his ongoing cooperation with special counsel Robert Mueller. The defence strategy Trump’s team reportedly plans to adopt is fairly standard, legal experts say. By impugning the character of the prosecution’s star witness – especially one who has already admitted to lying to federal agents – defence lawyers can argue his testimony isn’t credible. Any attacks on Flynn by the defence, however, “would be an uncomfortable 180” given Trump’s consistent and public praise of Flynn over the past 10 months, said Jens David Ohlin, a criminal law expert and vice dean at Cornell Law School. “It is a standard or typical defence strategy, but that’s because clients usually listen to their lawyers and keep quiet so as to preserve their options down the line,” Ohlin said Thursday. Flynn pleaded guilty earlier this month to making false statements to federal agents about the nature of his conversations with former Russian ambassador Sergei Kislyak during the presidential transition period. Flynn evaded more serious charges related to his undisclosed foreign lobbying work – and alleged involvement in a kidnapping scheme – by agreeing to cooperate with Mueller’s ongoing investigation into the Trump campaign’s ties to Russia. Asked about Flynn’s guilty plea earlier this month, Trump lamented what he saw as “unfair” treatment by the FBI and Department of Justice. “I feel very badly for Gen. Flynn,” Trump told reporters. Trump has also refused to rule out a pardon for the man his legal team reportedly plans to demean, and he continued to praise Flynn’s character even after he was forced out of the administration. Trump has occasionally attempted to distance himself and his administration from Flynn. He reminded his followers in one March tweet that “General Flynn was given the highest security clearance by the Obama Administration,” and told Fox in April that “Obama, I guess, didn’t vet” Flynn. Privately, however, Trump was bitter over Flynn’s ouster and continued to offer him words of encouragement through April, according to Yahoo News. “Mike Flynn should ask for immunity in that this is a witch hunt (excuse for big election loss), by media & Dems, of historic proportion!” Trump tweeted on March 31. Wright said prosecutors will likely pepper the defence with questions about when the president lost confidence in Flynn; why he waited three weeks to remove Flynn once he knew he lied to Pence (and perhaps to the FBI); why the president raised the Flynn issue with Comey; and why he has continued to make statements supportive of Flynn. While Trump’s reported defence strategy may be standard, then, it won’t necessarily be effective. “Don’t confuse a defence with a good defence,” Bob Deitz, a former top lawyer at the CIA and National Security Agency, said in an email.